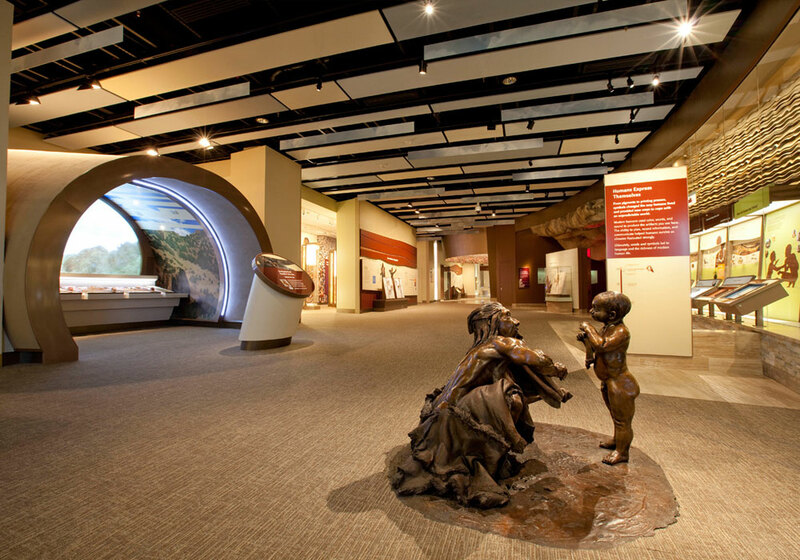 Smithsonian National Museum of Natural History: David H. Koch Hall of Human Origins – Capitol Exhibit Services, Inc.
After an intensive competitive bid process CESi was chosen to detail, fabricate, deliver and install this major exhibition focusing on the origins of human history. In addition to our own in-shop fabrication and installation work, our scope included managing the general contractor. This CESi sub was charged with space demolition, drywall installation, flooring and finishing, stonework and metal structures, mechanical and electrical work, lighting and security, fire suppression and life safety systems. In addition to the GC, we also managed an outstanding team of subcontractors who joined us on this very prestigious Smithsonian project. Our subs included illustrators, scenic designers and installers, wallpaper specialists, glass suppliers and installers, a glass case fabricator (in Belgium), and artifact mount makers and installers. We were also required to provide art direction services and interface with a forensic sculptor, casting foundry, A/V systems integrator, and Smithsonian Office of Exhibit Central who was responsible for the Lucy diorama. To kick off the project, CESi initiated the on-site GC work and took ownership of Halls 11 and 12 at the Natural History Museum. Running concurrently with the demo and site prep work was the production of over 400 custom illustrations and the development of the design detail drawings. Because of the speed at which the project had to be completed (14 months from start to finish) we employed as many as six detailers to produce the project shop drawings. Running close on the heels of this work was a significant amount of art direction and graphic file prep. Among the many exhibit components included in the Hall of Human Origins is a Time Tunnel with custom LED chase lights and a large curved rear projection screen, graphic rails with both touch screen displays and mechanical interactives, large glass cases with no exposed visible hardware, bas-relief sculptures, a cave reconstruction, three cone-shaped “Snapshot” structures with rear projection screens and interactive rails, a theater with Corian and stone seating and a Corian projection surface, other stone and Corian seating throughout the Gallery, numerous wallpaper graphic murals, custom handmade virus sculptures, and approximately 250 objects.